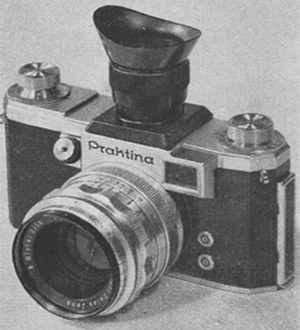 At the Trade Fair in Leipzig, in September 1953, the VEB Kamera-Werke Niedersedlitz released the PRAKTINA FX with its definitive aspect and with small changes compared with the last prototype. 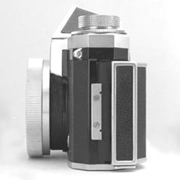 New are the eye-level finder with a different shape, the "KW Germany" logo marked on the top of the body cover and the eye-level optical finder with a different edge. 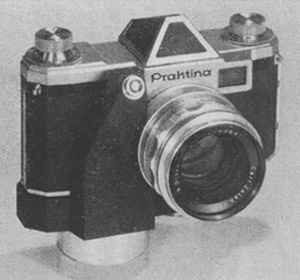 The camera has the mechanism to close automatically the diaphragm of the semi-automatic lenses to the pre-selected aperture, two standard F and X coaxial contacts for bulb and electronic flash units and the name "Praktina FX" stamped on the front. 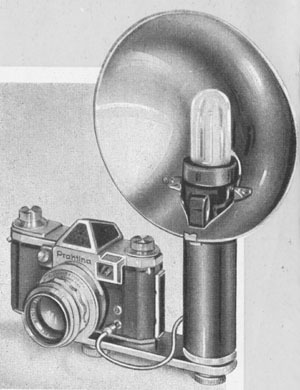 In some cameras of this model the mechanism to control the lens diaphragm is missing. 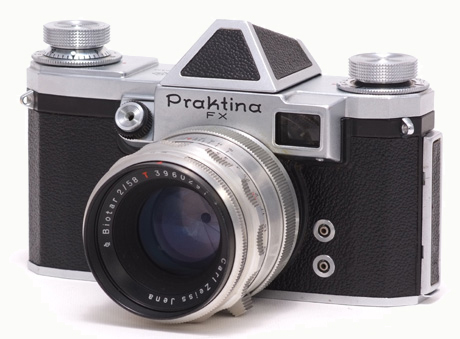 • a single-axis non-rotating dial with shutter speed settings from 1" to 1/1000"
The Praktina sports a set of innovative features that place it remarkably ahead of its time. 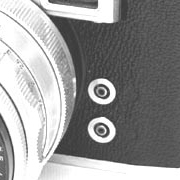 It took seven years to see a new SLR camera, the Nikon F, with the same professional features. 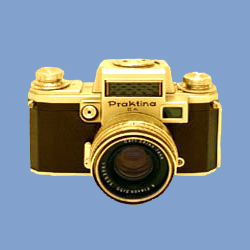 It is possible to value the high technical specifications reached by this camera comparing the Praktina with the 35mm SLR produced up to 1953: Asahiflex I, Asahiflex Ia, Kine Exakta, Kine Exakta II, Exakta Varex, Exakta Varex VX, Exa, Zenith, Alpa Reflex, Alpa Prisma Reflex, Alpa Alnea Mod. 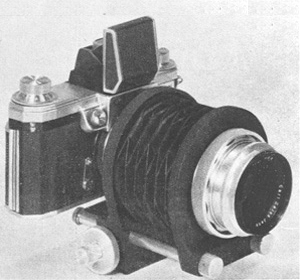 4, 5 and 7, Rectaflex 1000, Rectaflex Junior, Rectaflex 1300, Praktiflex, Praktica, Praktica FX, Contax S, Contax D, Pentacon, Wrayflex I and Contaflex. 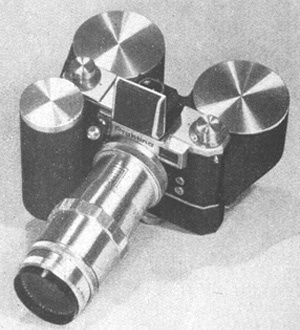 At the Leipziger Trade Fair, in September 1953, the Kamera-Werke showed the prototypes of some accessories including a 17m magazine back, a stereoscopic viewfinder, a bellows focusing attachment with ratio 1:1, a spring motor and an electric motor. 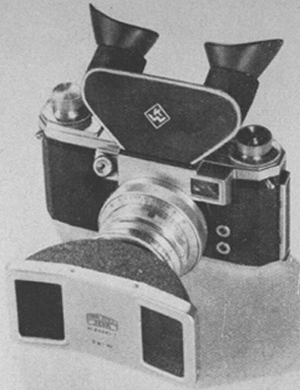 In a brochure of 1953 were listed the following lenses: Tessar 4.5/40, Biotar 1.5/75, Triotar 4/135, Sonnar 4/300, Fernobjectiv 8/500 and Telemegor 5.5/180. 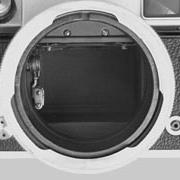 • Lens diaphragm control: for semi-automatic lenses (SB); none in version 2. 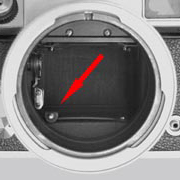 • Flash connection: standard F (bottom) and X (top) coaxial contacts for bulb and electronic flash units.